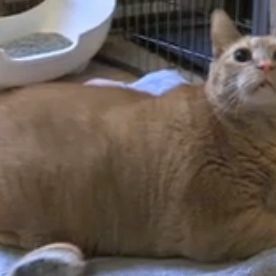 Sponge Bob the oversize 9-year-old cat died from an inoperable heart growth, reports the Post. “Sponge” or just “Bob” arrived at Animal Haven in New York earlier this year after his owner went to a nursing home. Sponge quickly went on a strict diet and fitness regimen after probably eating all day for its first nine years. He became something of a celebrity in June when Today featured him in a segment, after which a Manhattan couple adopted the oversize charmer. Goodnight, sweet prince.